Can You Handle 10 Hours Down In Pumpkin Hill!? It’s Halloween in a few days and Sega has given us all an early treat! Or is it a trick? Anyone who is anyone knows that Halloween is nothing without pumpkins. And where do you find pumpkins? Pumpkin Hill! So Sega has uploaded a 10 hour mix of Pumpkin Hill just for you! Continue reading Can You Handle 10 Hours Down In Pumpkin Hill!? Sure, Mystic Mansion got its day in the limelight, but you didn’t really think I forgot about “A Ghost’s Pumpkin Soup,” did you? The definitive Sonic Halloween track quickly gained renown among fans and within the gaming community at large for hammy lyrics and dancing pumpkin men. Today, we’ll be taking a look at a little known mashup for Mash-Up Monday: Halloween 2016 Edition! Mashup artist How2BEpic brought the infamous Pumpkin Hill to the world of Gaia, with the renowned theme combining with that of the sycophantic servants to Queen Brahne: “Jesters of the Moon” Zorn and Thorn of Final Fantasy IX. Have a listen below! [VIDEO] The SSMB Sings “A Ghost’s Pumpkin Soup”, and Other Spooky Treats! Welp, it’s that spooky time of year again, when kids dress up as monsters and go door to door for free candy, when adults marathon horror movies, when spooky, scary skeletons send shivers down your spine… or when Sonic fans dust off their consoles and ain’t gonna let it get to them; they’re just gonna creep down in Pumpkin Hill in order to find their lost piece! And that is exactly what we’re sharing with you today, for the fine folks at the Sonic Stadium Message Board have come together this holiday to sing a fabled Halloween carol: A Ghost’s Pumpkin Soup, by Tomoya Ohtani and Hunnid-P! I shed a tear… That was utterly magnificent. Great job, SSMB, great job. I tip my hat to you all for participating! Makes you want to join a future The SSMB Sings, doesn’t it? You can even download this disasterpiece for yourself! Just right click, then hit save on the link. In any case, before we close off October, here are a few other spoopy recommendations~! A Ghost’s Pumpkin Soup, as covered by SuperPsyguy and Mic the Microphone! Sonic Zombie Origins, providing your yearly slice of Halloween (or Christmas?) insanity from Balenaproductions! Pumpkin Hell – an unreleased alternate version of the original track, uncovered by CriticalMcBob! Although it goes without saying, we’ve got a YouTube channel! Subscribe today for bonus TSS content and more upcoming shenanigans! A few weeks back we reported on several Sonic Adventure 2 items scheduled for release on the XBox Live Marketplace and a Harmonix list of future releases, both hinting at the release of the second Sonic Adventure title for download. We can now confirm that Sonic Adventure 2 will be hitting XBLA in the near future, with the game having now been listed on the Marketplace website [EDIT: Link is now dead – T]. 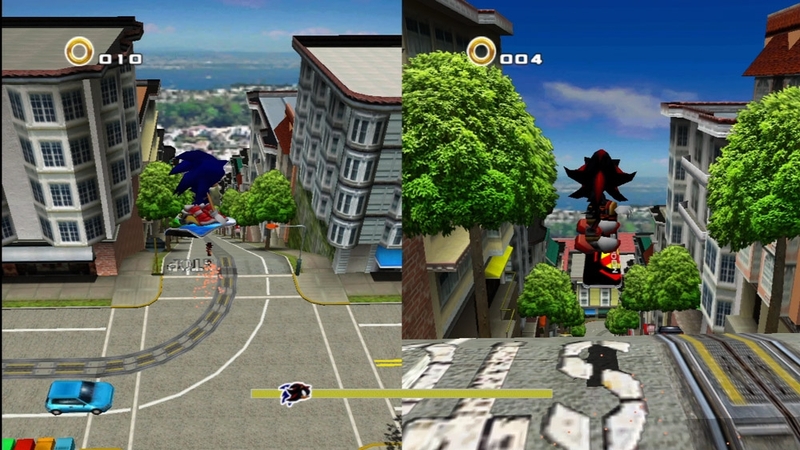 From the details given, it looks likely that this HD version of the game will be the Sonic Adventure 2: Battle release with the listing of a “1-2 players” feature (with Chao Karate featured and the XBLA Sonic Adventure being the DX release), along with downloadable content likely to be composed of the avatar items reported earlier this month. The current scheduled release date is the 3rd of October 2012. At the moment there are no details as to the cost of this download – we will keep you updated as further infor becomes available. EDIT: Thanks to Damnhedge’s eagle eyes, he’s spotted a tell-tale hint this will also be making it’s way to the PSN!